With nine, including Thursday morning, the Baton Rouge area has now registered more freezes so far this winter then all of last winter, which had seven. The latest freeze ever recorded at Metro Airport in Baton Rouge came on April 13, 1940. Freezing temperatures are also expected on Friday and Saturday morning. A *HARD FREEZE WARNING* continues for the entire WBRZ Weather Forecast Area from 7pm Thursday to 10am Friday. There may be a re-issuance of the HARD FREEZE WARNING by the National Weather Service Friday night as well, but that seems less likely at this time. A *HARD FREEZE WARNING* means temperatures will be below 25 degrees for several hours. An extended period of such temperatures could cause significant damage to sensitive vegetation and crop loss without adequate protection. There is also the potential for freezing and bursting of outdoor water pipes. Be sure to wrap water pipes. Anything from insulating foam, to towels to newspaper can be used. Leave a light drip overnight to keep the lines moving and less prone to freezing. If you do notice a loss of water, a freeze or break has likely occurred. You can search for the trouble spot and attempt to thaw the line with a hair dryer or hot towels, but look for a leak upon melting. If this occurs, the pipe may have broken meaning you should shut off the main line and call a licensed professional. Of course, all this information is precautionary and you should always check with a licensed professional for official guidance or service. Make frequent checks on the elderly. Make sure their furnaces are working and heating the house properly. Pets are also subject to the extreme cold. Keep pets indoors as much as possible. If this is not possible...make sure outdoor pets have warm...dry shelter and provide sufficient food and fresh, unfrozen water. Today and Tonight: Thursday will bring another afternoon of sunshine and cold temperatures. Thermometers will make it into the mid 40s, warmer than the previous few days, but still quite cold. Winds will be light and northeasterly. Another hard freeze is possible overnight with a low forecast in the mid 20s. Up Next: The weather of Friday will essentially repeat that of Thursday, and then some change will begin to occur over the weekend. Sub-freezing temperatures are anticipated Saturday morning but highs should be able to squeak into the low 50s. 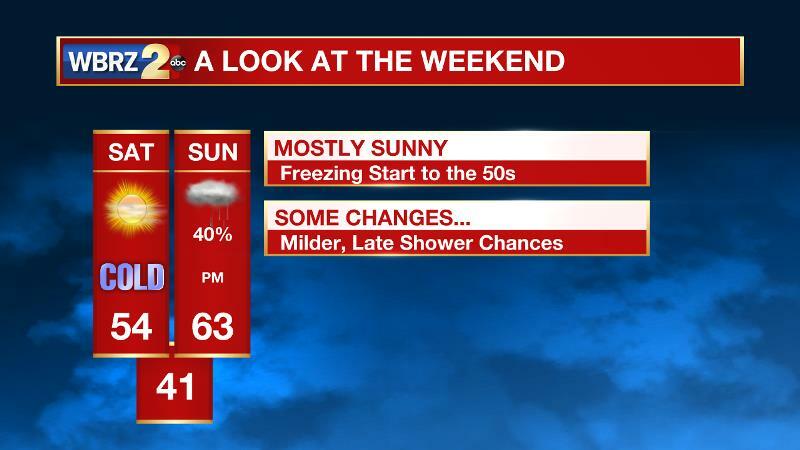 Sunday morning will be above freezing with afternoon readings returning to the 60s. Rain showers will arrive Sunday evening and last into Monday. The Explanation: As a deep trough remains entrenched over the Eastern two thirds of the United States, Thursday and Friday will stay dry and cold. With such low atmospheric moisture, little in the way of cloud cover is expected; perhaps a ripple of positive vorticity advection could create some passing cirrus clouds at times. On Saturday, winds will shift to a southeasterly direction as surface high pressure moves to the east coast. This will pull temperatures above 50 degrees and prevent a freeze on Sunday morning. With seasonable temperatures, a shortwave trough will push across the Southeast on Monday leading to rain showers and possibly a thunderstorm. This wave will likely bring another cold front through the area too, but this time temperatures will only be a few degrees below average and then quickly moderate.